Aside from the on-ice product, which has been truly lousy over the past few seasons, the Islanders arena, Nassau Coliseum, is a small, out-dated facility (second-oldest only to MSG, which is undergoing extensive renovations). On TV it looks like a poorly lit barn - even more so after the Islanders' employed a group of deranged animals in lieu of a hockey team for part of last season. 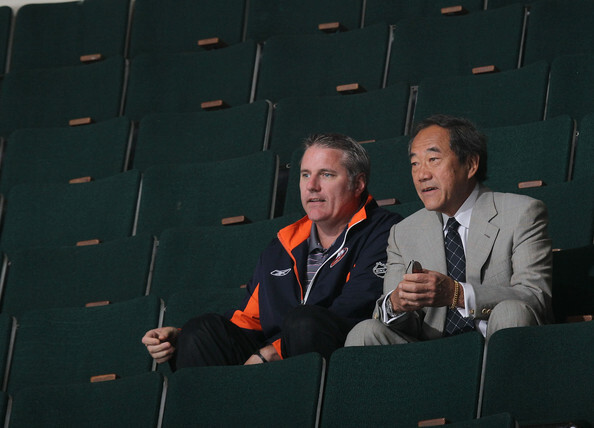 The Islanders’ owner, Charles Wang, has attempted to update the Coliseum for a number of years. Originally, Wang proposed the Lighthouse Project, which centred on a renovated Coliseum, along with a huge development plan that called for housing, hotels, restaurants, and even a minor league baseball stadium. It was an ambitious, multi-billion dollar project. The Lighthouse Project eventually died after being rejected by the public, but was replaced by new plans to rebuild the Coliseum with the aid of $400 million in taxpayer dollars, estimated to cost every local taxpayer $58 dollars more a year for the next 30 years. $58 might not seem like much over the course of a year, but Nassau County is pretty much broke – to the point that they brought in outside help to slash their budget by hundreds of millions of dollars. The plan faced a referendum to decide whether Nassau County, a suburban community with some of the country’s highest property taxes, would actually help fund the project; the plan was defeated on Monday by a margin of 57-43. The rejection, which itself cost taxpayers’ over $2 million (of which Charles Wang promised to pay on the condition that the outcome was ‘yes’), leaves the Islanders’ future on Long Island in jeopardy. The Islanders’ current lease in Nassau Coliseum ends in 2015 – a fact Wang has used to try to strong-arm the public into paying for his new arena. Owners have used this tactic for decades: force taxpayers into funding their projects through threat of relocation. NFL owners worked this angle to perfection over the past few decades, squeezing new stadiums out of the public with little actual cost to themselves. Daryl Katz, multi-billionaire owner of the Edmonton Oilers, wants the government to kick in millions of dollars for a new arena for the Oilers. Edmonton always seemed close to losing their team during the mid-to-late-90s and using the veiled threat of relocation to publicly finance a new arena plays upon the latent fear that your team could be ripped away from you. You see, fans have an emotional investment in a team, which sometimes can cloud their rational judgment. If there is a threat that your team is about to leave, what other choice do you have? Owners are really just concerned with making money. Why foot the bill yourself when you can get a whole bunch of suckers to do it for you? The primary argument for public support of these multi-million dollar projects is that a new stadium/arena will help create jobs and revitalize the surrounding area. This is a nice thought, but multiple empirical studies have shown that this is a fallacy. Most of these studies show that the economic benefits of a new stadium/arena is negligible when compared to the actual cost. In certain cases the cost greatly exceeds the economic value created by the stadium. That’s what happened in Cincinnati when residents of Hamilton County coughed up millions to build two new stadiums - one for the Cincinnati Reds and one for the Cincinnati Bengals in 2000. According to some estimations, the project cost between $350-$454 million depending on who you believe, which the county is still struggling to pay for. Last year the annual tab was $34.6 million, or 16.4% of the county budget. I like sports and all, but in no world do I see the benefit of paying for a silly stadium over essential social programs. This is especially true considering the current economic status of the United States. Wang is one of the 400 richest Americans according to Forbes, with a net worth estimated at $890 million. I have an idea: why don’t you gather up some private investors and fund the project yourself? I guess he tried that. It's not surprising that failed as well. Can you blame the citizens of Nassau for refusing to hand over $400 million to the man who pushed the signing of Rick DiPietro? I wouldn’t trust Charles Wang with the task of going to the store to buy a loaf of bread; he would come back with an expired bag of dinner rolls that he overpaid for and intends to freeze for the next 10 years. Nothing Wang has ever done with the Islanders has indicated he’s a responsible or even competent owner. I wouldn't lend him $4. Wang has already been rejected from leading a private bid to rebuild the Coliseum; now he’s being rejected from doing so with public funding. By voting ‘no’ on a new arena in Long Island the residents of Nassau County haven’t turned their back on the Islanders: they turned their back on Charles Wang. It’s about time. If you're going to cite Cincinnati, you should also cite lower downtown Denver (LoDo) which was completely revitalized when the Colorado Rockies built Coors field. Yes, there is no promise that every stadium will be that successful, but many are.